People have been reading on computer screens for several decades now, predating popularization of personal computers and widespread use of the internet. But it was the rise of eReaders and tablets that caused digital reading to explode. In 2007, Amazon introduced its first Kindle. Three years later, Apple debuted the iPad. Meanwhile, as mobile phone technology improved and smartphones proliferated, the phone became another vital reading platform. In Words Onscreen, Naomi Baron, an expert on language and technology, explores how technology is reshaping our understanding of what it means to read. Digital reading is increasingly popular. 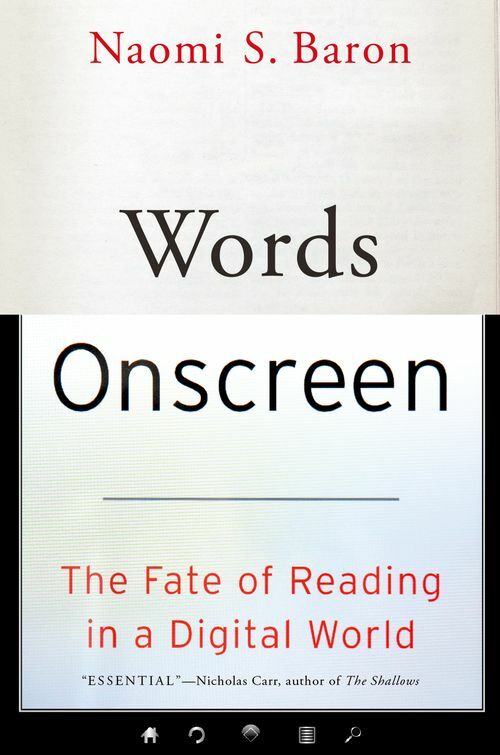 Reading onscreen has many virtues, including convenience, potential cost-savings, and the opportunity to bring free access to books and other written materials to people around the world. Yet, Baron argues, the virtues of eReading are matched with drawbacks. Users are easily distracted by other temptations on their devices, multitasking is rampant, and screens coax us to skim rather than read in-depth. What is more, if the way we read is changing, so is the way we write. In response to changing reading habits, many authors and publishers are producing shorter works and ones that don't require reflection or close reading. In her tour through the new world of eReading, Baron weights the value of reading physical print versus online text, including the question of what long-standing benefits of reading might be lost if we go overwhelmingly digital. She also probes how the internet is shifting reading from being a solitary experience to a social one, and the reasons why eReading has taken off in some countries, especially the United States and United Kingdom, but not others, like France and Japan. Reaching past the hype on both sides of the discussion, Baron draws upon her own cross-cultural studies to offer a clear-eyed and balanced analysis of the ways technology is affecting the ways we read today-and what the future might bring. Chapter 6. How Social is Reading? Naomi S. Baron is Professor of Linguistics and Executive Director of the Center for Teaching, Research & Learning at American University in Washington, DC. She is the author of Always On: Language in an Online and Mobile World.